That’s right, folks. The Giants beat the Eagles on Sunday! Not only did the Giants avenge their Week 5 loss to Philly, but they also won their second straight game. That means we’re on a winning streak! Woooot. Like their win last week against the terrible Vikings, this one wasn’t exactly pretty, but it got the job done. Also, the Redskins and Cowboys also lost, which puts the Giants just 2 games out of first place. I know, I know. We don’t need this kind of hope and enthusiasm, especially with the upcoming schedule the Giants are facing, but let’s at least go into the bye week with a little ray of sunshine! There was lots to be proud of in this game. For one, the defense made it through their second straight game of not allowing a touchdown. For a unit that had previously allowed over 30 points a game, that’s huge. 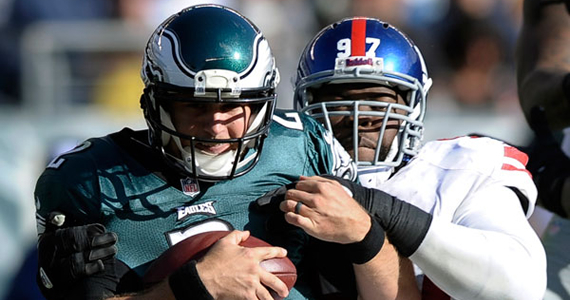 Sure, Michael Vick stunk it up and then left with an injury (mirroring the last time the Eagles faced the Giants), but the Giants then abused rookie Matt Barkley. They also again dominated LeSean McCoy, who claims to be one of the best RBs in the league. The Giants also ended up with 4 sacks (Antrel Rolle, Mathias Kiwanuka, Terrell Thomas and Linval Joseph) which almost equaled their total from the whole rest of the year (they had 6 coming into this game). Granted, the Eagles offense stunk, but it wasn’t like when the Vikings offense stunk. This was a very well played defensive game. The MVP of this win, however, wasn’t on the defensive side of the ball… or the offensive side. Being that the Giants refused to score TDs (more on that later), they relied heavily on the right leg of Josh Brown, who went 5-5 on FG attempts (40, 44, 33, 46, 27) and accounted for all of the Giants points. He might be a good guy to pick up in your fantasy football league if he’s available, because the Giants love them some FGs. The offense, despite not having any major scores (as our friends in the CFL call them), did have some highlights. 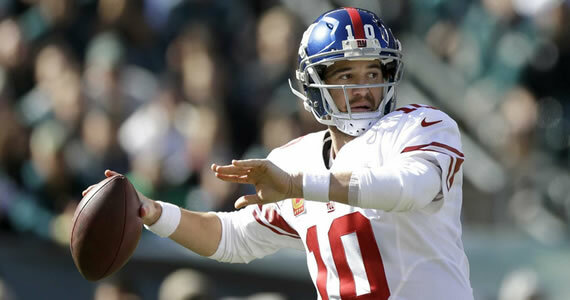 For one thing, Eli Manning (25-39, 246 yards) didn’t throw an interception for the second straight game. If you watched any of his first six games, this is a big accomplishment. As usual, Eli made a couple of crazy throws, but he managed to keep them out of the hands of the Eagles secondary. He did manage to find seven of his own receivers, which is a good job of spreading the ball around effectively. By the way, he also passed Hall of Famer Phil Simms to become the leading passer in Giants history with his now 33,694 yards in the air. (Charlie Conerly is 3rd with 19,488 and Kerry Collins is 4th with 16,875.) Good on you, Eli. Finally, how about that Peyton Hillis? After sitting on his ranch for a few months, Hillis came back to lead the Giants in rushing and almost receiving in Week 7, and he continued the good work in Week 8. Hillis wasn’t spectacular, but his 20 carries for 70 yards kept the ball moving, and he also caught 3 passes for 15. This has been a lovely resurrection story for the Arkansas product. Between him, Michael Cox and Brandon Jacobs the last three weeks, the Giants’ running attack has solidified a bit. As a result, the Giants have played much better. Despite the low score, there actually wasn’t too much bad to report in this game. The main takeaway from this win is that the Giants need to find a way to get the ball into the End Zone on a more consistent basis. Even if two of their Field Goals had been Touchdowns instead, this game would have been a lot more comfortable than it was. Hakeem Nicks absolutely refuses to score TDs. It’s like he’s trying to use reverse psychology to earn his big free agent deal this spring. I mean, it’s not always his fault, but he needs to find pay dirt, and soon… mostly because he’s on my fantasy team. Also, for the second straight week, and I want to say the fourth or fifth week overall, the Giants’ Special Teams allowed the opposition to score a TD. This time, they didn’t allow a typical punt return TD though. They at least got a little creative with it. 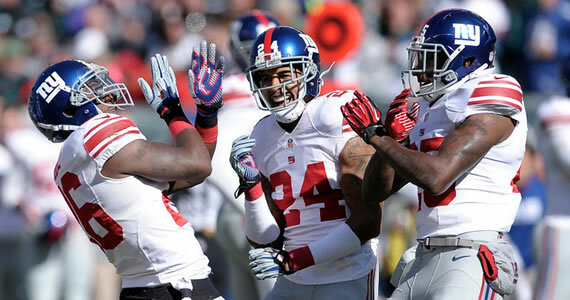 Late in the fourth quarter, with a 15-0 lead, the Giants had to punt from deep in their own territory. Long Snapper Zak DeOssie apparently thought the Giants were doing the old snap it out the back of the End Zone to give away the safety play (not from the 36 yard line, they wouldn’t), because he fired the ball way, and i mean way, over punter Steve Weatherford’s head. Weatherford, who actually had a really great game, ran up to the ball as it neared the goal line and (I think) tried to kick it out the back of the End Zone to preserve the Safety. His legs didn’t quite respond the way he wanted them to, and he basically fell all over himself. The Eagles recovered for their only score, and made this game much more of a nail biter than anyone thought it would end up being. Thankfully, the Giants have reached their bye week on a high note. The pitiful performance of the rest of the division so far this season has allowed the Giants to somehow climb back into the race, despite they 0-6 start. Do I really think the Giants can win this division? Probably not. Even in their wins, they haven’t exactly blown quality opposition out of the water. The Vikings are awful, and the Eagles played worse than that. 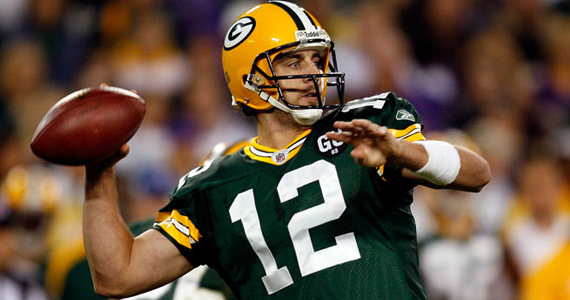 After the bye, the Giants open up the second half of their season against the Oakland Raiders, but then face the Green Bay Packers. The latter is a tall order of any team, let alone one that’s playing like the Giants of late. However, I’m still not ready to rule them out completely, because seriously… this division stinks. A .500 record might win it.